This is one of the shorter Ace Double combinations I've seen. Silverberg's novel is about 34,000 words long, Temple's about 30,000. This is also a pretty minor pair of short novels -- neither is really memorable. It's a rather preposterous little piece of pulpish fun. And it is in its way fun -- though probably only a novelette's worth. Silverberg has always been a facile writer -- I don't mean this in a bad way, I think writing with facility is a virtue, though not a necessary virtue. What I mean by this is that his writing flows nicely -- he's just easy to read, he compels reading. Even if, as in this case, what you are reading isn't all that good. The protagonist is named Abner Harris -- but in reality he is Aar Khiilom, an agent of the Darruui. He has been sent to Earth, surgically altered to look like a human, on a mission to try to influence Earth to support Darruu in an anticipated war with their ancient enemy, the Medlin. He arrives on Earth, with orders to spend his first ten days or so just blending in. Indeed, a pleasant affair with a local woman would be just the thing -- and he is about ready to bed the beautiful Beth Baldwin when he receives a message from his boss -- emergency! He is compelled to stand her up. It turns out that the Darruui have discovered that the Medlin have also infiltrated Earth. Abner's new job is to assassinate as many Medlin as he can. And his first assignment -- wait a minute, you'll NEVER GUESS this incredible plot twist -- is to assassinate a Medlin agent who is impersonating an Earth woman under the name Beth Baldwin! Of course it turns out that Beth has the jump on him, and soon she and her fellow Medlins are trying to turn Abner/Aar to their side. It seems they are convinced he is a rare virtuous Darruui. More to the point, the Medlins have decided that their primary job is to nurture humans -- it seems that humans have begun to evolve into superbeings -- the future truly belongs to the arriving superhuman race. The rest of the story involves Abner/Aar resisting at first -- he cannot stand to betray his people, and eventually learning the deeper truth etc. etc. All in all, a silly story, very minor Silverberg, a bit too rapidly resolved -- nothing special at all. But as I said, enjoyable enough reading on its own terms. 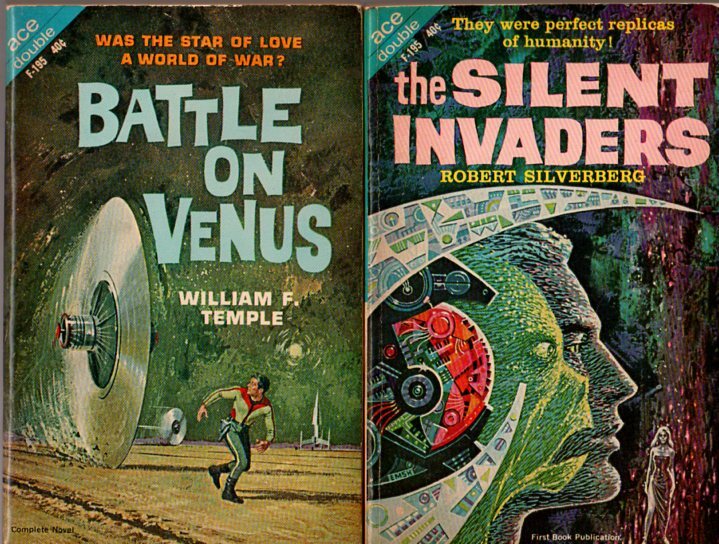 William F. Temple was an Englishman involved in the UK SF scene from very early -- he roomed for a while with Arthur C. Clarke, and he was editor of the Journal of the British Interplanetary Society. He wrote a number of juvenile novels, both SF and other, and a few SF novels and a number of short stories. He wrote three Ace Double halves, two of which were later combined to make another Ace Double. 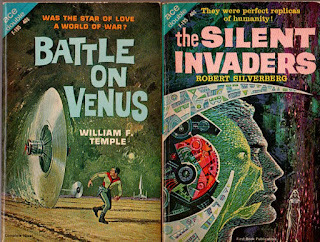 The cover of Battle on Venus features what seems to be a huge runaway disk from an old fashioned mainframe disk drive, chasing a man with the proportions of a Darrell Sweet humanoid. (Noting that Sweet's drawings were supposedly of actual humans, but that can't really have been the case.) I just mention that because it struck me as amusing -- the cover is actually a somewhat accurate representation of a scene from the book. The book concerns the first expedition to Venus, led by a lugubrious Captain who believes himself cursed by his first name (Jonah), and crewed by several redshirts and a "professional explorer" named George Starkey. The ship comes in for a landing only to find itself being shot at. And once on the surface, a variety of tanks and the like begin attacking. The crew are also menaced by the runaway disks. But all of a sudden the attacking tanks turn around and start defending the ship from another attacking set of vehicles. And all attempts at communication are met with silence. Things finally quiet down, and George Starkey takes a helicopter on an exploring mission, only to be shot down. Luckily he is found by a beautiful girl from an isolated settlement, a girl who has spent her life as an expert thief (part of her culture), but who has decided to leave her home city. She and George are quickly in love, despite cultural differences. They manage to make there way to the home of the personage who, it turns out (big surprise) is orchestrating all this chaos. And ... well, we learn why this endless pointless war continues, and George and his love make there way back to the ship, and ... and ... It's hardly worth describing. It's really another pretty silly story. Along the way there are occasional cute bits, a little humour, competent but not distinguished writing. And it's short. In all, surely one of the more forgettable Ace Doubles. I love reading your reviews of the old Ace Doubles. I have a nostalgia for them even though I only read a handful back in the day. Mainly those by Samuel Delany. I owned dozens of them, and constantly saw them in used bookstores in the 1960s and 1970s. I've always wanted to go back and read more but never do. So reading your summaries are the next best thing. So far, few of them sound worth the trouble. Yet, it's pleasant to read about them. And looking at their covers trigger fond memories.